The Nutshell, deemed one of England's most noteworthy (and tiniest) pubs, spans a staggering 15ft by 7ft. Paying homage to England’s most beloved alcoholic beverage, for which the country is renowned and often sought after, the new National Brewery Centre – a world-class interactive museum and visitor centre showcasing England’s proud brewing heritage and its influence on brewing techniques throughout the world, officially opened this week in Burton upon Trent, Staffordshire, in the heart of England. Boasting hundreds of exhibits and rare artifacts, plus a variety of multi-media presentations, the chance to see brewing first hand, and of course sample some beers, the new National Brewery Centre, was officially opened on September 21, 2010, by HRH The Princess Royal, after being closed for almost two years. To celebrate the opening, VisitEngland, the official tourism body for England, is honoring one of the country’s most important national treasures, the English Pub, by highlighting some of the most noteworthy. These include pubs that are known to be haunted, the smallest and oldest pub, as well as Michelin star properties, where the food is as much an attraction as the ale. One of England’s most remote pubs, undeniably worth the effort it takes to be discovered, is the Pandora Inn near Truro, Cornwall. Located in South East England, The Mermaid Inn in Rye, Sussex, is one of the country’s oldest and most enchanting inns. Famed for being England’s smallest pub, The Nutshell in historic Bury St Edmunds, Suffolk, in the East of England, proudly holds the title of smallest pub in Britain as confirmed in the Guinness Book of Records. 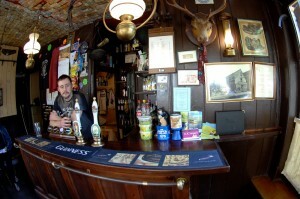 Claiming to be England’s Oldest inn, Ye Olde Trip to Jerusalem in Nottingham is also quite possibly one of the country’s most unique pubs, carved into rock and connected with the labyrinth of sandstone caves at the foot of Nottingham Castle. Situated next to the Royal Shakespeare Company in Stratford-upon-Avon, The Dirty Duck is world famous in Theater circles. Often referred to as a model for the perfect English Country Pub, The Star at Harome is a Michelin-Star restaurant and pub in North Yorkshire. Built to serve herring fishermen in the area, The Olde Ship at Seahouses on the Northumbria coast in the North East of England, features a nautical theme and boasts a rich collection of antique maritime artifacts. The Philharmonic pub in Liverpool is a dazzling Art Nouveau pub where the Men’s lavatory is so magnificent that women are invited in to view its ornate, marble urinals and toilets, as part of a guided tour. Believed by many to be haunted, the Grenadier in London’s Mayfair, is an atmospheric old pub filled with character and military history. For further information please visit www.innengland.com here.